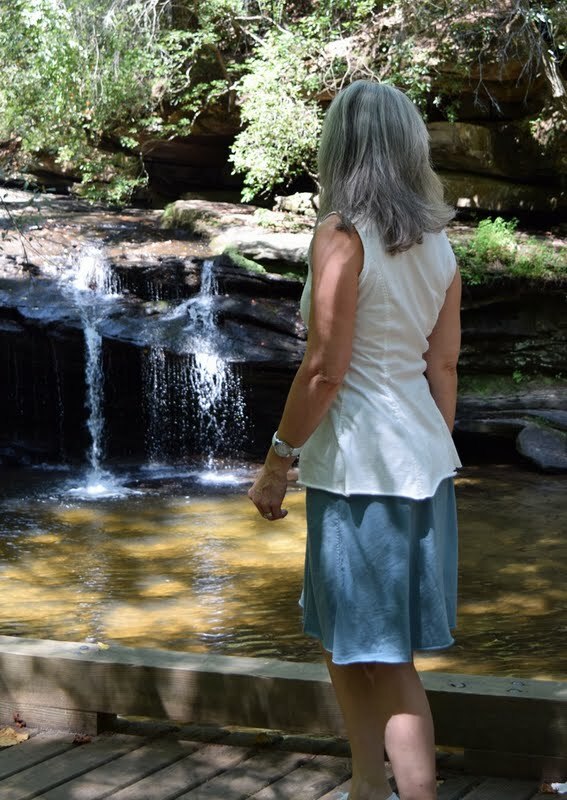 On this extremely hot warm August afternoon it was deemed a perfect day to catch a waterfall at Table Rock State Park. School has started so the park was quite quiet. Almost felt like I had this beautiful nature all to myself. Nice. 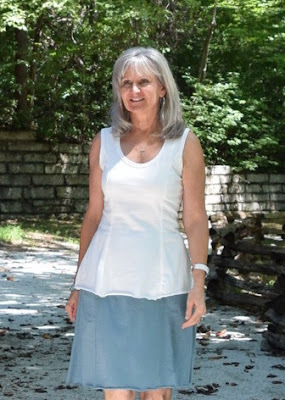 I'm wearing my Alabama Chanin hand-stitched modified 6-panel skirt along with the AC hand-stitched 6-panel Tank Top. Interesting in that I made these pieces to be an ensemble, but now they are made I don't really care for them together. But today I am showing them as the ensemble they were meant to be. Mine is simply hand-stitched. With pockets. But let's back up and start at the beginning. I really wanted to make the 6-panel Gore Skirt from the book Alabama Studio Style that was designed to be a part of my 6-panel Tank Top from the same pattern sheet. After the pattern was traced and cut out I quickly found out that my sliver of fabric would not accommodate that pattern. At all. 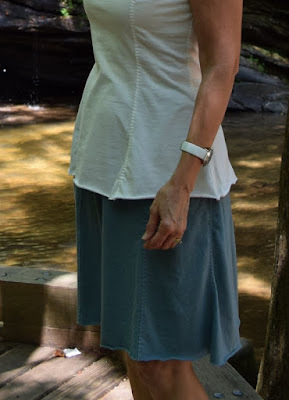 Having already made the 4-panel Short Fitted Skirt from Natalie Chanin's Alabama Studio Sewing + Design I knew how it fit, so thought the pattern might could be modified into a 6-panel skirt. Photo below is the 4-panel Short Fitted Skirt. I love this thing and wear it all the time. 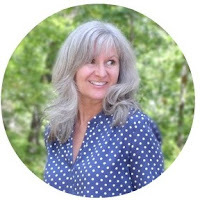 Anyway, I had my heart set on a 6-panel skirt with pockets, so with great bravery and courage..... much unlike my usual think, re-think and analyze everything self when cutting precious fabric.... I cut my 4-panel skirt pattern into a pattern for a 6-panel skirt and promptly cut into my precious Alabama Chanin fabric. Still cannot believe I did all that that quickly! And it worked out well. Almost all is hand-stitched with Coats and Clark Button Craft thread.... double strands for inner construction stitches, and single strand for the flat-felled seams with machine-stitched turned down casing for 1" elastic at the waist. Pocket bags were serged because I used a woven and did not want them to fray. Worried about having enough room at the hips for the pockets, and knowing I shortened the 4-panel skirt 2" at the hemline.... instead of taking the 2" off at the hem on this skirt, I took the 2" off at the waist which made for a little more room for the pockets. I'd run out of the Dusk fabric, but had enough scraps to make part of the pocket bag that might be seen and used a darker blue woven for the rest of the bag. With the hand-stitching, you can stitch down the front of the pocket openings and I really like the look of this a lot. So there it is. 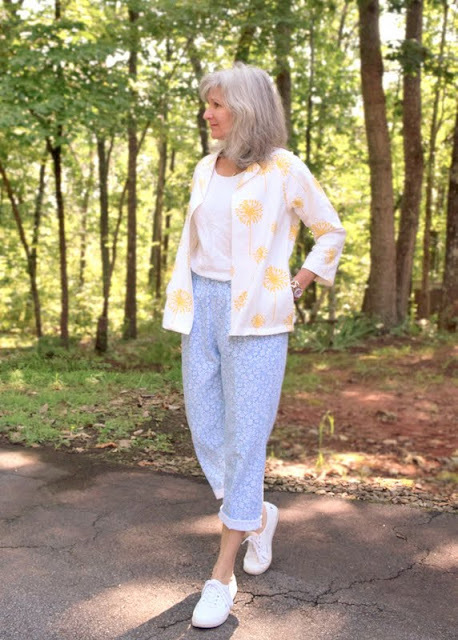 My Alabama Chanin simple ensemble. I like.... no love..... both pieces separately, but am not keen on them together. 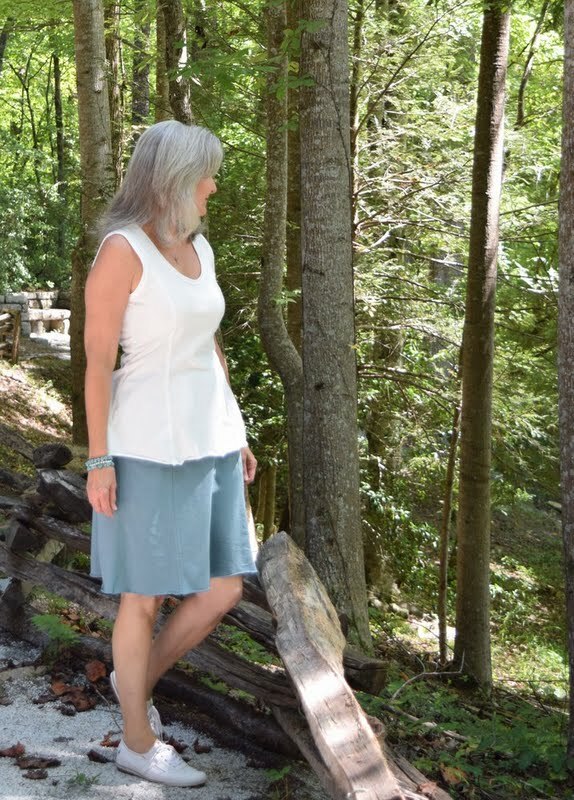 The skirt is the most comfortable skirt, and the Alabama Chanin organic cotton jersey is the softest cotton jersey fabric against the skin.... but the skirt feels sort of 'full' at the waist and grabs the jersey tank top and makes me feel a little frumpy? Not that flattering on my figure, maybe? Anyway, the skirt is mostly worn at home and is most loved for the comfort it affords. I will say, now that I've got a couple of simple AC garments under my belt, feel I am better prepared to tackle a more challenging project. Am also finding that I love the hand-stitching process. 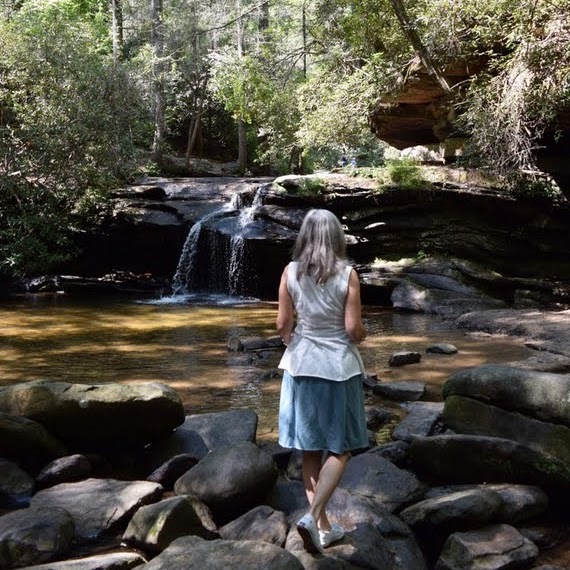 And it was oh-so-nice to spend a few minutes at one of the waterfalls along the Carrick Creek Trail this day. You could hardly have chosen a more beautiful location for your "fashion shoot." 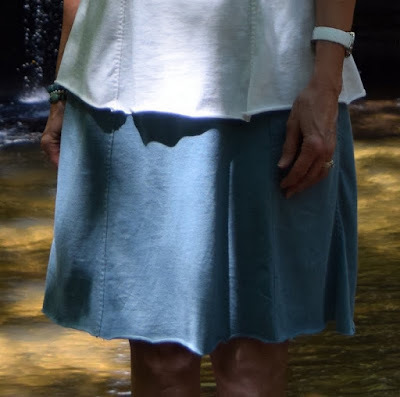 I know we all tend to point out what we feel are flaws or mistakes in our handwork projects and I do understand what you are saying about this particular top and skirt together . . . but it looks lovely in the pictures. Both pieces are lovely - you did a great job on them. I love your pictures - the scenery is gorgeous! Two great garments, Lisa. Good for you taking a chance on cutting the 4 panels into 6. Gotta take a chance now and then! Like you, I'm not sold on them being worn together. I think the top is a little too long but I like my tops to end at the high hip. But whether you wear them together or not, they are beautiful and an amazing example of craftmanship. I love the hand stitching, both pieces are pretty.